$37.56 $46.95 As Low As $0.66 ea. 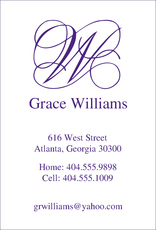 This is a set of flat notes, size 6.2" x 4.5" with matching blank envelopes in your choice of triple thick stock. Your choice of raised ink color. Return address and optional envelope linings available. Typestyle and positioning only as shown.